E. Ginzel, Consultant with Materials Research Institute. Merv Hoff , Senior Co-ordinator for NDT and Welding with TransCanada Pipelines. Jim Mihell, Manager of the Materials Engineering Department of TransCanada Pipelines. During a recent production run in a pipe mill, several defective welds were not detected at the NDT inspection stations. 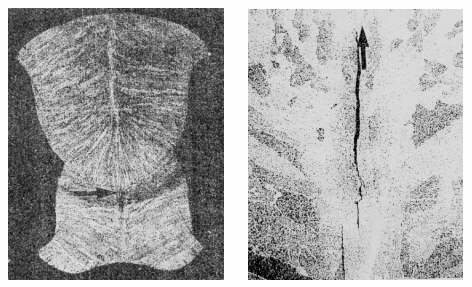 These defective welds contained shrinkage cracks in the submerged arc weld that originated at the base of the inside weld nugget and propagated towards the inside surface. These cracks were considered serious as some had a depth of 20-30% of the through wall dimension. Figure 1 shows a macro of a typical such case with the crack shown in the inner nugget of the sub-arc weld. The micro indicates the vertical extent of the crack to be 1.2mm or about 8% of the wall thickness. It was subsequently determined that part of the problem causing the defects to be missed was due to a difference between the mechanised ultrasonic scanning and the manual scanning calibration set-ups. During follow-up re-inspection it was seen that even the mechanised UT technique did not always detect the defects. Scanning by the mechanised UT technique followed a typical CSA-Z245 procedure (this is essentially identical to the procedural requirements of API 5L, ISO 2604 and DIN EN 10208-2). This technique requires a pair of angle beam probes for examining the ID half of the weld, a pair of probes for the outside diameter side of the weld and a pair of transverse looking probes. Figure 2 illustrates the typical probe positioning for this inspection. Note: although nominal 70° probes were used in this specific application, the codes permit angles anywhere from 45° to 80° refracted. Attention was drawn to the problem when eventually a radiograph was required on a suspect indication and a linear indication was seen on the radiograph. TransCanada Pipelines decided to investigate further so required a Time of Flight Diffraction (TOFD) technique be used on all pipe of the affected lot in the mill. A TOFD configuration was quickly incorporated into the system and operated in parallel with the standard mechanised (final) UT system. Results of the scanning are summarised in the Table 1. With a nearly vertical orientation, the shrink crack defect was ideally suited to be detected using TOFD. The principles of TOFD are illustrated in Figure 3. When a defect was detected using TOFD it was then investigated using a Pulse-Echo technique using a nominal 70° probe from the inside surface. Figure 4 shows the positioning of the probe for the ID surface scan. Table 1 indicates that the standard mechanised UT from the outside surface was not always effective in detecting the defects, yet reasonable correlation existed between the TOFD and ID pulse-echo techniques. Evidence from this evaluation has raised concerns as to the reliability of UT using the minimum requirements of the procedures outlined in CSA-Z245 and other codes using the same principles. Use of TOFD in this particular instance was very effective in identifying areas of concern. However, TOFD requires special equipment and evaluation of results is generally slow. Training and comprehension of operators would need to be far more elaborate than the present training provided for the "go/no-go" approach presently used. 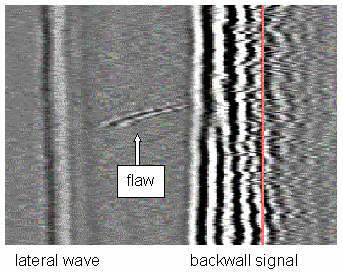 Figure 5 illustrates an example of the signal obtained from the flaws in the cracked weld seams. The distinct angled indication between the parallel signals formed by the lateral (top surface) and backwall (ID surface) indicate the defect originates near the middle of the weld and propagates to a point very near the ID surface. In order to explain how such serious defects could be missed using the traditional Pulse-Echo methods presently accepted in industry, a beam modelling approach was carried out. Figure 6 illustrates the ideal positioning of the full skip probe/beam in the traditional pipe seam inspection. Typically sensitivity calibration involves setting a response off the corner reflector geometry provided by a hole drilled in the weld on the weld centreline. Holes are of three types; through, 50% through from the OD and 50% through from the ID. The hole is normally 1.6 mm diameter (1/16 ") and the signal is set to about 80% full screen height. The fact that a slightly lower amplitude signal is received off the holes drilled half through the wall as compared to the through wall holes seems to assure the operators that they are truly looking at the inside and outside volumes separately. This is of course not strictly true but the operator assumes that the beam spread is adequate to provide all the coverage needed in the midwall region. Figure 6 illustrates the beam pattern from a 9x9mm 5MHz probe positioned so the centre of beam intersects with the top midpoint of the through hole of a calibration target in a pipe with wall thickness 15.3mm. This clearly shows that although ideally positioned for the OD near surface, the region in the midwall receives only the lower beam edge. Several assumptions are made using the standard technique shown in Figure 2. A peaked corner signal off the vertical hole correctly positions the probe, no matter what angles are used. The first assumption is reasonable for 45° refracted beams and adequate for 70° beams but fails for beams near 60°. Since the average pipe mill UT operator does not practice manual weld inspection, they do not use echo-dynamics to evaluate flaw position and characteristics. In the pipe mill, acceptance criteria is based solely on a "go/no-go" philosophy. Therefore the second and third assumptions lead the operator to think that any signal in the gate arises from discontinuities along the beam axis. Since their fixed "standoff" from the weld cap edge allows no forward and backward motion pipe mill UT operators cannot determine if the indication is near the toe of the weld or near the midwall. This lack of probe motion coupled with an extensive use of "reject" (also called "suppression") makes flaw characterisation impossible and even approximate positioning of the flaw in the vertical plane is not possible. Since the ID pulse-echo technique is more effective than the OD pulse-echo technique, another question is raised. Why is there such a difference? The answer lies primarily in the geometry configuration. It is always assumed that the centreline of the weld cap is adequate to describe the centre of the double-vee bevel (note: the term 'double-vee' is used loosely here as most SAW situations for such thin wall do not actually prepare a bevelled edge. Instead, the plate edges are left square). However, alignment of the wire in the submerged arc process is not so precise. If the OD cap is offset from the actual centreline by 2-3 mm and the ID cap is offset in the opposite direction by 2-3 mm the UT inspection may not be providing the coverage expected. This effect will be more pronounced for the ID looking probes. By placing the ID probes 6 mm further away from the centreline, the upper edge of the beam will be well away from the midwall region on one side. Any defects in the midwall region will be missed by one probe and the other probe will have the beam positioned to be more centred on the defect. When such a non-symmetric response was observed in the mill the pipe was sent for radiography. Since no flaw was seen on the radiograph the pipe was accepted. See Figure 7 for an illustration of the effect on beam coverage that results from offset weld caps. Symmetry of positioning maintained for weld cap on same side as probe. Beam position symmetry lost for weld on opposite side of plate when position reference is made relative to the weld cap. Centre of beam moved to toe of weld. Beam position symmetry lost for weld on opposite side of plate when position reference is made relative to the weld cap. Centre of beam moved to midwall region of weld. Using the top surface weld edge as the reference for positioning of the probe stand-off makes no change in the relative position of the beam for the upper half of the weld. However, this places the beam in the wrong position for the lower half of the weld when a cap offset exists. On the side where the lower half is offset further away, the beam is more sensitive to the weld cap edge and the midwall region is virtually missed. On the side where the lower half of the weld is closer the beam misses the far surface in the region of the weld toe and more of the central beam is directed at the midwall region of the lower weld bead. This dilemma of offset welds is exacerbated by standard tracking systems which can vary the probe standoff position by 4-5mm, or more, each side of the OD weld cap. It is conceivable under extreme conditions that with offset welds and poor tracking the ID probes might be looking at pipe plate instead of weld metal, if the combined error of 9mm is reached (depending on wall thickness). From the above considerations it can be seen that the greatest risk for poor or missed inspection, using the standard code procedures, exists for the ID targeted volumes. Figure 1 illustrated a centreline positioned flaw but the problem can be even more pronounced for off centred flaws, e.g. toe cracks. The same concern for significant amplitude reduction due to the off axis portion of the beam missing the flaw would result in missed defects. Use only refracted angles between 65-70 degrees for the ID. This increases the beam area that interacts with the inside surface. Introduce new ID targets to evaluate the extent of weld offset and tracking variation that can be tolerated. ID notches placed at maximum tolerance offset limits would indicate if the gate positions are adequate. Through wall holes offset from the centreline by the same maximum tolerances would indicate the effect of tracking error on amplitude response. Establish smaller tolerances and better mechanisms for tracking. The effect of tracking error offset on amplitude (as seen from item 2 above) may determine this tolerance. Use an extra pair of probes for the midwall region. Establish a planar target for midwall probe position calibration. Consider other options for extra UT coverage such as TOFD and Phased-arrays. Results of ultrasonic inspection on submerged arc pipe seams has shown that present code recommended procedures are inadequate to provide good probability of detection of defects in the midwall region and in the volume near the ID. Specular reflectors vertically oriented at the midwall provide a special problem for detection. Improved ultrasonic techniques and tracking methods are needed to ensure uniformity of weld quality in pipe seam welds. The probability of midwall specular reflectors occurring could be even greater for ERW welded seams as compared to SAW welded seams. Statistics for this project, concerning details of the TOFD versus Pulse-Echo inspection results, were collected by Merv Hoff and Jerry King. These details were obtained as a result of perseverance and considerable personal discomfort in miserable weather conditions. Also, thanks to Jean-Phillip Martin of RD Tech Canada for the TOFD defect image and providing the TOFD equipment integration into the standard mill configuration.